These kits use the bottom 10' section to embed in a concrete pad - you can embed either 5' or 3' depending on your installation need. See note below for specification limitations. 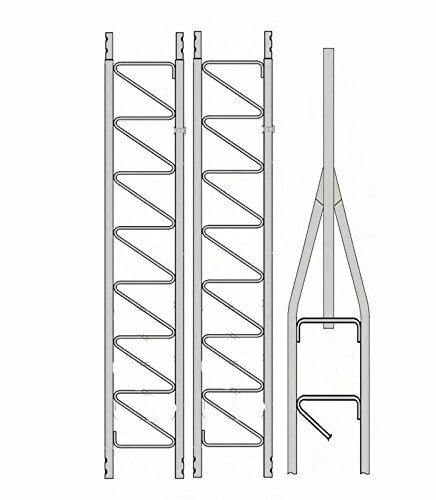 You can also purchase a variety of base sections, base plates, brackets, etc to accommodate this kit - see our store. *See Rohn 25G & 25G Self-Supporting Guides for Wind Load Specifications and Installation Requirements. These specifications only apply if you embed 5' of the bottom 10' section in concrete per the requirements* * Professional Installation Required. If your installation exceeds ice/wind/load ratings you must guy or bracket your tower* *If your installation exceeds the load/wind/ice ratings put forth by Rohn (see attached documents) you must bracket and/or guy your installation. These items are not provided and can be purchased separately. Grounding kits are also available for purchase separately (see Rohn BGK3G) **These tower sections must ship via FREIGHT. Your delivery location must be able to accept a full size semi. If a forklift is not available at the delivery location (such as a residence or business without a dock), you will be required to unband the pallet and remove the tower sections from the truck by hand (average weight is 45 lbs per section). When the freight company contacts you to schedule a delivery appointment they will ask you if you require a liftgate at delivery - this would allow the driver to remove the pallet as a whole from the truck. This service is not standard and not included in your cost - if you wish to have a liftgate you will be responsible for those charges at delivery.